Stock # 18097P, 4.3L V6 Cylinder Engine, Automatic, 11900 mi. 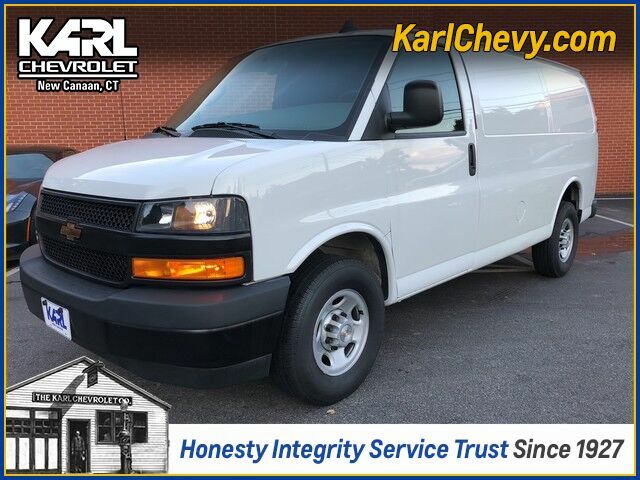 This like new Certified Pre-Owned 2018 Chevrolet Express 2500 Cargo Van is proudly offered by Karl Chevrolet. If you have cargo to move, the Chevy Express Van is your tool to get the job done. Huge cargo space in a garageable size makes the Express Van the ideal choice for working in residential areas like Connecticut. Save thousands over new PLUS get the peace-of-mind of the Chevrolet Certified Pre-Owned Warranty! This Chevrolet includes: PAINT, SOLID BODY, STANDARD (STD) SEATING ARRANGEMENT, DRIVER AND FRONT PASSENGER HIGH-BACK BUCKETS Bucket Seats EMISSIONS, CONNECTICUT, DELAWARE, MAINE, MARYLAND, MASSACHUSETTS, NEW JERSEY, NEW YORK, OREGON, PENNSYLVANIA, RHODE ISLAND, VERMONT AND WASHINGTON STATE REQUIREMENTS MEDIUM PEWTER, VINYL SEAT TRIM Vinyl Seats SEATS, FRONT BUCKET WITH VINYL TRIM Vinyl Seats Bucket Seats BATTERIES, DUAL HEAVY-DUTY 770 COLD-CRANKING AMPS, MAINTENANCE-FREE TRANSMISSION, 8-SPEED AUTOMATIC, ELECTRONICALLY CONTROLLED 8-Speed A/T A/T 2500 VAN PREFERRED EQUIPMENT GROUP SUMMIT WHITE ENGINE, 4.3L V6 V6 Cylinder Engine Gasoline Fuel TIRE, SPARE LT245/75R16E ALL-SEASON, BLACKWALL Conventional Spare Tire GLASS, FIXED REAR DOORS WINDOWS AIR CONDITIONING, SINGLE-ZONE MANUAL (STD) A/C AUDIO SYSTEM, AM/FM STEREO WITH MP3 PLAYER AM/FM Stereo Auxiliary Audio Input MP3 Player GLASS, REAR DOORS DOOR, SWING-OUT PASSENGER-SIDE, 60/40 SPLIT (STD) *Note - For third party subscriptions or services, please contact the dealer for more information. * Your buying risks are reduced thanks to a CARFAX BuyBack Guarantee. There is no reason why you shouldn't buy this Chevrolet Express Cargo Van WT. It is incomparable for the price and quality. The quintessential Chevrolet -- This Chevrolet Express Cargo Van WT speaks volumes about its owner, about uncompromising individuality, a passion for driving and standards far above the ordinary. As always, our goal here at KARL Chevrolet is to assist you to find the perfect vehicle to meet your needs. While we strive to have the area's best selection of quality pre-owned vehicles in stock at all times, we know there are times when a customer may have very specific needs. If you have a specific model or features that you are searching for, please let us know. You might be surprised how quickly we can find a match! Just another KARL Advantage .... finding you the perfect vehicle at the best overall value. Thank you for the opportunity to assist in your vehicle search.